Last weekend was rain in sheets and mud in slides and stuck cars and fab food. There was lots of stitchery and knittery and a bit of french knottery and much nattering, way past the Cinderella, through to the wee pumpkin hour. Thank you for having me you fine crafty camp cohorts. This is not the bummer bit. 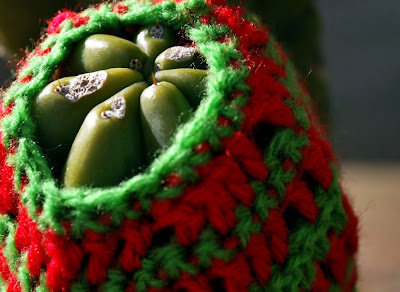 Because there is now an unspoken law that craft camp at Sewjourn requires some form of yarnbombing (er, comment loudly Jan, should you beg to somewhat differ), I tackled a cactus nodule. Fortuitously, the spines are currently, but tiny (evil) hairs and inflicted stinging hand torture for only a little of (the entire) drive home. I have visions they will grow to the nail-thick, needle-sharp, inches-long clusters of the neighbouring cactus – so defining my objet d’art as wildly impressive, rather than mildly disturbing. Another piece of inspired mischief was committed by a talented Ye Yarnbomber Who Shall Remain Nameless Until Ye Yarnbomber Outs Herself. At my first craft camp there were the leggings. Tinniegirl conspired a short while later with the scarf. Jodie came to the party with the fishy dinner. YYWSRNUYYOH (Ye Yarnbomber Who Shall Remain Nameless Until Ye Yarnbomber Outs Herself) produced the sweetest, storkiest hat. This is not, strictly speaking, the bummer bit. I have a theory that at some point, throughout the constant sheeting-rain, storming weekend, that a solitary, freak-of-nature lightning strike, fearsomely struck in an otherwise lightning-less weekend. Attracted to the friction of acrylic leggings on metal legs, the stork was tragically, dramatically, smote. Either that or Magda had one of her sneezing fits. This is, most decidedly, the bummer bit. Future craft campers, the challenge is hereby issued. The stork needs a new bottom. Oh, sad news for the natty stork indeed but, I do have faith that clever crafters will rise to the challenge in fine form! Nice job on the cactus, hope you haven't injured yourself beyond crafting. Oh no! Talk about the world falling out of your bottom! 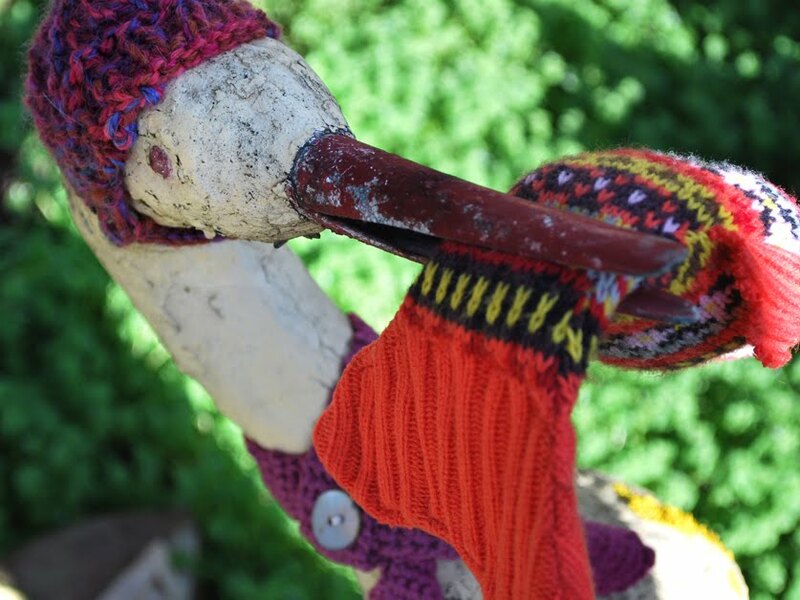 Surely you don't think this is the stork's subtle protest about the yarnbombing? Firstly, I'm ridiculously jealous of your weekend of knittery and stitchery. I did laundry and vacuuming and tried to get some work done but it all went horribly wrong because.... oh, I shouldn't have started this... move on. Let's just say I'm a shade of envious green that is rather unbecoming. Anyhoo - you sure know how to set a challenge. I hope someone sorts out that rear end before I get to Sewjourn in November. It's got me stumped... so to speak. Great photos T, lovely our muddy shoes! i think the Stork Incident was definitely an act of god.... and he looks very splendid in his hat. maybe the next yarnbombing could be a pair of soakers to hold the bottom back on?? Are you insane? 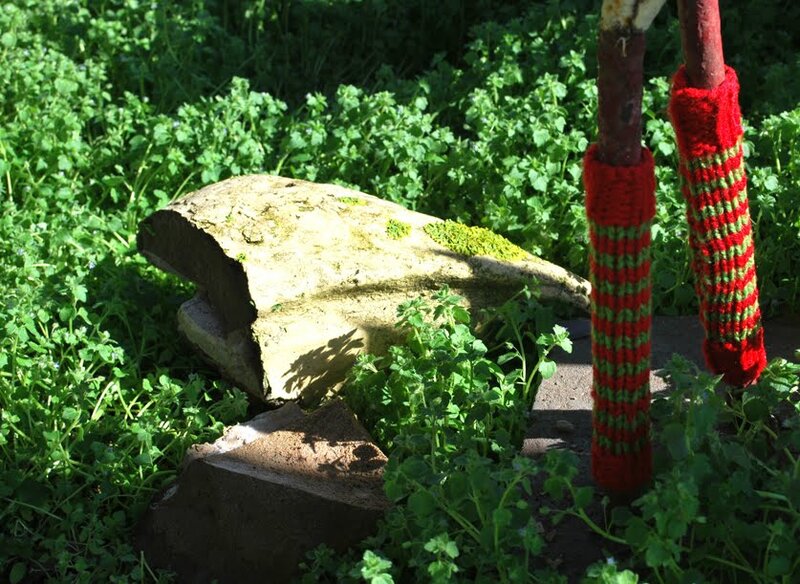 Yarnbombing a cactus? I have a hideous cactus in my back garden, I want it GONE, but it is too hard to remove due to all the spikes. 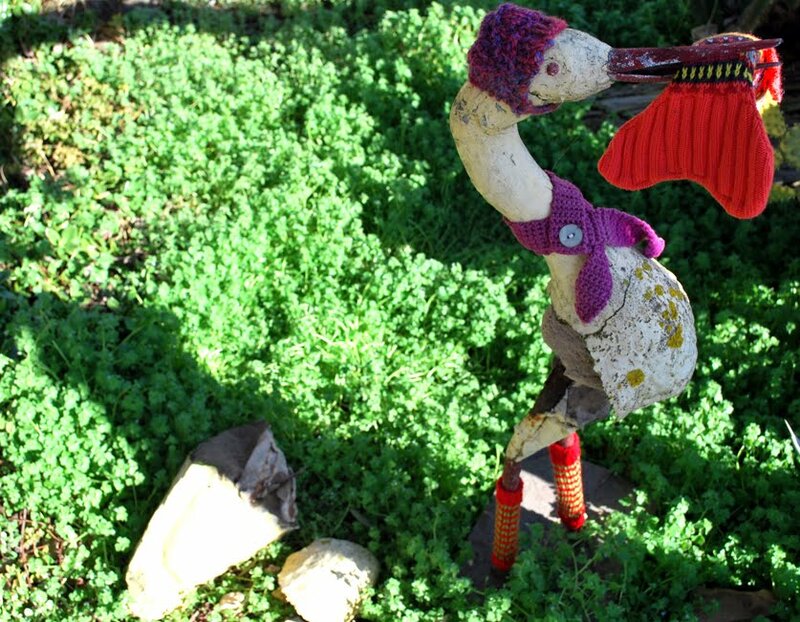 Stork does not seem to mind that her bottom is missing - until she wants to sit down. She's going to need a prosthetic bottom at the very least. I second the mosaic idea! It's gonna get heat stroke in summer. Maybe a storkish bikini to change into? Whether it was my sneezing or indeed the farting, I think you throw down a fair challenge to the next Sewjourners, though I'm still disappointed nobody has yet taken me up on making the Stork a pair of arseless chaps. I'm unable to produce these myself as I don't do yarn. 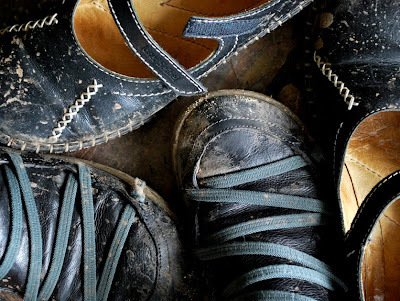 Great photo of muddy shoes! WIN. Oh dear, our poor beloved stork. It may take more than yarn to fix that behind! Love the cacti work, and love the bonnet. Haha - the cactus picture is hilarious! I love the um, cactus hat. But yeah, as far as the stork becoming arseless - maybe she's had one too many storkettes? Or something? Can't wait to see what happens next to poor storky. a behind for a stork...now there's a challenge...perhaps something from the mister? The Bloke has dubbed your crochet a prick warmer. 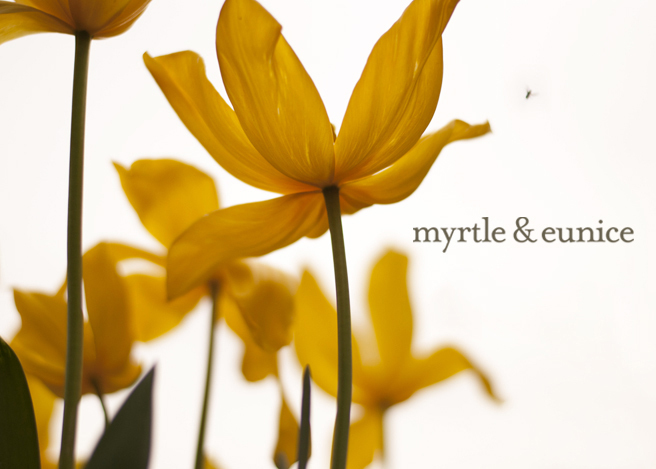 Sounds like a great weekend away (slightly envious also!). If there are any other concrete creatures in that garden I imagine they are feeling pretty nervous about now. Did you feed baked beans to that poor little Stork? 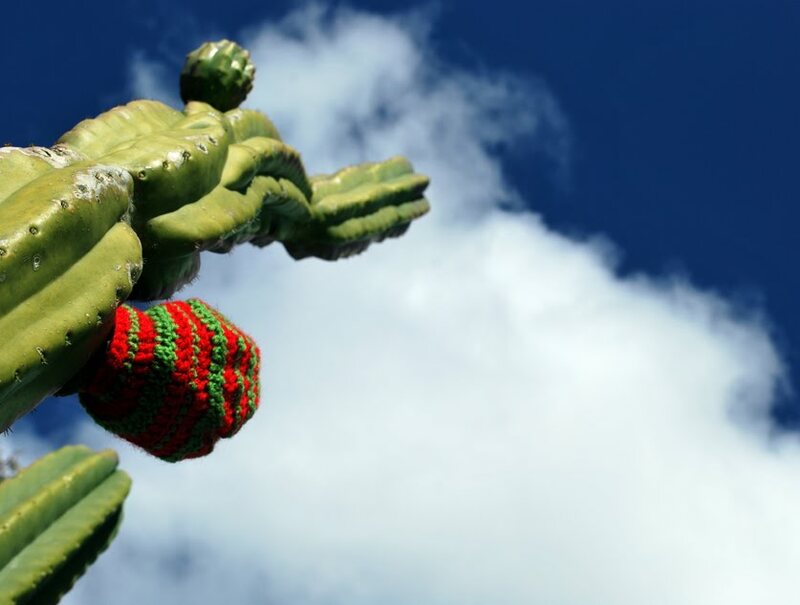 I have just recently learned what yarn bombing is. I was like..."What da? ", but I like it! I have never ever seen anything like that around here. I really want to learn how to knit and I am planning on learning this Fall/Winter with a beginners book. I am contemplating yarn bombing something. I'm quite sure my husband will think I have lost my mind, but he will definately appreciate it! By the way, the stork is adorabley hilarious! the leg warmers are cracking me up! and I love the little hat..to bad about the lightning strike!! oh..and I really can't believe you yarn bombed a cactus!!! you are a crazy lady, and I respect that! Ouch! Those cactus hairs can hurt (which is a worry seeing from your photo how many weeds are in the cactus garden waiting to be pulled out when I get home....) But can't wait to see all the stork's fashion accessories.....if the rest of him stays upright for that long that is! Oh dear the poor fella! It was Magda's patented trademarked Fart Soup! At least his head is warm. I'll out myself here to announce - the little aviators helmet is going up on Ravelry this weekend. Ahh, I see Suse has outed herself! Very sorry to see the stork's drastic liposuction... A challenge indeed. Glad to see that you braved the cactus though- Excellent work! Jan needs to watch out or in time the whole place will be wrapped in knitting..
Oh, that was so funny. I loved the dressed up stork, he looked awesome, but what a hit on the bum! Love it!!!!!!! Hope he can be fixed.